Gaston: Impressive, little sister. Your skills are strong, but not strong enough! Franny: Your words do not threaten me, brother. Franny: (After blocking them all, again) Your meatballs are useless against me. Gaston: Then perhaps it's time for spicy Italian sausage! Franny: That's right. I did it. (The Robinsons are having dinner.) Uncle Fritz: Oh, hooray, Italian food! Aunt Petunia: Huh! I wanted a sloppy joe! Bowler Hat Guy: What's going on? Why aren't you seizing the boy?! Tiny the dinosaur: (in dinosaur language) I have a big head, and little arms! I'm just not sure how well this plan was thought through. Dr. Krunklehorn: ...Hey, you never know if one of your students will invent the next integrated circuit, or microprocessor, or integrated circuit--Oh, wait! I said that already. Well, I just don't get out of the lab very much. Is that a bow tie? I like bowties. I HAVEN'T SLEPT IN EIGHT DAYS! Mr. Willerstein: Well, can I get you a cot, or something? Dr. Krunklehorn: Nope! I got the caffine patch. It's my invention. Each patch is the equivelent of twelve cups of coffee. [rolls up sleave to reveal arm covered in patches] You can stay awake for days with no side effects. AHHH! Sorry. Dr. Krunklehorn: I haven't slept in eight days! Teacher: Well can I offer you a, uh, cot? Dr. Krunklehorn: Nope! I've got the caffeine patch! I invented it myself. One patch is the equivalent to twelve cups of coffee. You can stay awake for days with no side effects! (screams loudly) Sorry. Bowler Hat Guy: Ahhh, yes! You are now under my control! (Bowler Hat Guy laughs and Frankie does monotone laughing) Bowler Hat Guy: Stop laughing. Bowler Hat Guy: Don't repeat everything I say! Frankie: I won't repeat everything you say. Bowler Hat Guy: Uuuuhhh. Did you just say excellent because I said excellent? Grandpa Bud: I think my wife Lucille's baking cookies! Grandpa Bud: Bake them cookies, Lucille! 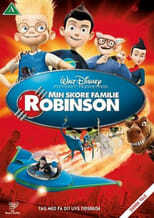 Lewis: (naming off the Robinsons)...Spike and Dimitri are twins, and I don't know who they're related to. Lewis: Why is your dog wearing glasses? Wilbur: Whoa ho! I am not crazy! Lewis: Oh yeah, Captain Time Travel? Prove it. Wilbur: If I prove to you I'm from the furture, will you go back to the Science Fair? Lewis: (sarcastically) Yeah, sure; whatever you say. (Wilbur pushes Lewis from behind) Hey, what are we going? (Lewis looks where Wilbur pushes him) What are you doing? Let go of me! Mildred: No, no! You didn't kill him. He's perfectly fine. (Cousin Laszlo spraypaints Cousin Tallulah's hat.) Tallulah: Laszlo, you stop painting my hat, or I'm telling Ma! Laszlo: Ah, lighten up, sis! Tallulah: Lasz, I mean it! Aunt Petunia: WHAT IS ALL THE YELLING OUT HERE?! Tallulah and Laszlo: HE/SHE STARTED IT! Aunt Petunia: I don't want to hear ANY MORE! Grandpa Bud: That's strange. She usually takes the Harley. Wilbur: Pop quiz. Who've you met, and what have you learned? Lewis: Okay, Bud, Fritz and Joe are brothers. Fritz is married to Petunia, and is she...? Lewis: Tallulah and Lazslo are their children, Joe is married to Billie, Lefty is the butler, Spike and Dmitri are twins and I don't know who they're related to. Wilbur: Neither do we. Go on. Lewis: Bud is married to Lucielle and Cornelius is their son. What does Cornelius look like? Lewis: Okay, Cornelius is married to Franny and her brothers are Gaston and Art. Lewis: Forgetting...? Oh, right. Wilbur is the son of Franny and Cornelius. Wilbur: And no one realized that you were from the past? Lewis: Thank you, thank you, hold your applause, thank you very much. "Around here, however, we don't look backwards for very long. We keep moving forward, opening up new doors and doing new things... and curiosity keeps leading us down new paths. - Walt Disney"
Dr. Krunklehorn: Oh, wrap him up! I'll take two!